Welcome to our Calgary Station. We look forward to welcoming you as our Guest! Our Calgary location is an ideal starting-off point for your vacation throughout the Canadian Rocky Mountains. With their stunning scenery and abundance of campgrounds, Banff, Jasper, and Yoho National Parks are great places for experiencing Canada at your own pace. Culture and ethnic diversity abounds in Calgary. At last count, Calgary was home to more than 240 different visible ethnic minority groups and this translates to boundless dining opportunities. Note: Unfortunately, due to space restrictions in our transfer vehicles, we are unable to guarantee the transfer of bikes, large sports equipment or excessive luggage. Please call to discuss your transfer requirements, and we will advise if this is possible. Otherwise we will arrange a private transfer (at Guest's cost). CanaDream is happy to offer a complimentary shuttle service between our Calgary Station and the local airport and airport hotels. Guests should call the Station to pre-book their transfer after 8am on the morning of pick up. 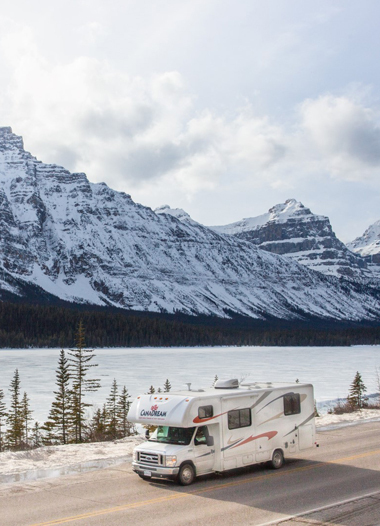 Choose from the wide variety of RV models available for rent from our Calgary location.